Take your chance to learn the most impressive motorcycle stunt from a Pro. 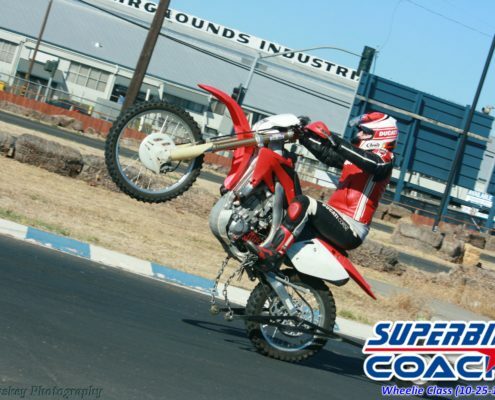 Book your seat on our Superbike-Coach Wheelie bike and use your own bike, to get that done with step-by-step lessons. You will get these lessons in a safe area and riding your bike- as well as our Wheelie-Bike which has a wheelie bar. You learn from your Coach how to use your body, and how you have to use the equipment. He gives you all the tools you need to do it the right way. We will take your fears away and give you reachable goals. Under the eyes of the Coach of course, you also have to use your own motorcycle to practice doing wheelies, because finally you make wheelies on your bike. 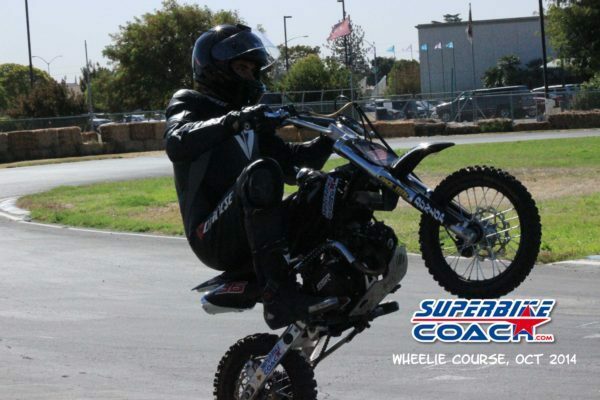 Early booking strongly suggested, because mostly our wheelie classes are sold out up to two month ahead. 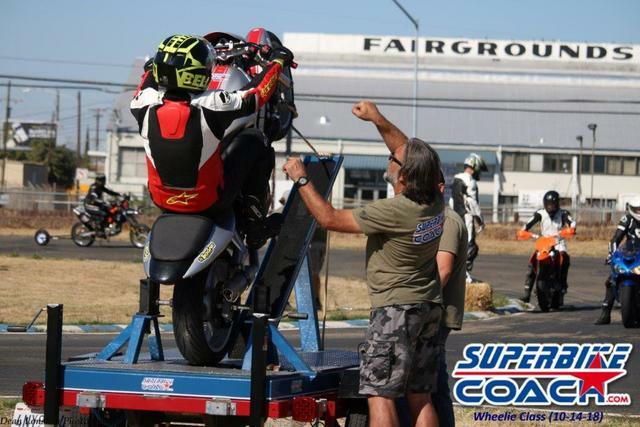 Your Superbike-Coach Wheelie Course starts at 9:00am to an estimated end time of about 4:30pm. Maximum 30 spots are available. Three professional coaches train you all day in groups, and our staff is supportive and fun. You’ll learn balancing, feeling, throttle control, and yea- also how to fight riding demons. The wheelie class never attracted hooligans, but people with a eager to learn new things and to challenge themselves. You can use your own bike, our rental or bring a 3rd party rental bike. Our school bike in the 1on1 wheelie bike on which you also have some sitting time on. That’s when you are coached individually by Headcoach Can Akkaya. Our mini bike is real fun, and it teaches you the correct body position and feel for the height. This class is very unique, and so are coming riders from all over the country and sometimes from overseas to take advantage. Superbike-Coach wants to make sure that you have a unforgettable day. So as good as we can, we take pictures and high definition videos of your wheelies, which you will get for a FREE download. For people with a long travel, or don’t want to use the own bike, we have a rental wheelie bike for only $190. It comes with gas and our self constructed wheelie bar. Most riders, especially from far away, are also taking the Knee Down course one day before the wheelie class. Just add it in the booking process. If you also wish to book a rental bike and/or the ‘Knee Down’ course- please add these options during the booking process.